Product is rated 5.0 out of 5 by 4. Rated 5 out of 5 by Kimberly from Easy and affordable! We did short runs (500 pieces) of labels for a variety of branding things we do in our office. It was easy to set up and you didn't have to order thousands to place an order, which made it very affordable! Rated 5 out of 5 by Minke from Great Service Quick and professional service. Very happy with my order. Rated 5 out of 5 by LSLTX from Great quality! Great service! Great value! We have never been disappointed with an order from PrintPlace. Highly recommended! Custom label printing makes it easy to put your company name, logo, or statement on any surface. Whether used to place a mailing address, for product packaging, or on drink bottles, personalized labels remind customers of your business. You could also print custom sticker labels for big events like a wedding or trade show. A square shaped label suits most logos. The rectangle is recommended for mailing labels. The oval and circle shape work as custom product labels on food or drink items. 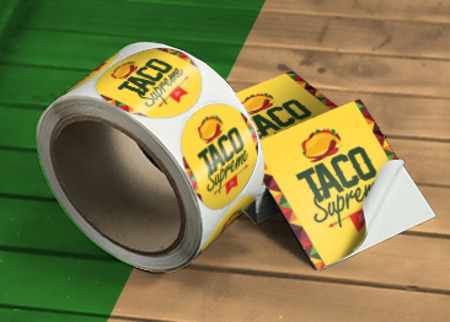 We print custom labels on two kinds of sticker paper. Our standard white label paper is best for items used only indoors. Adding a matte coating gives it a smooth finish while gloss brightens the colors on your design. Apply high gloss UV coating for a shiny, water-resistant finish. White vinyl sticker paper is waterproof and suitable for products displayed outdoors or stored in a refrigerator such as custom wine labels. Its high gloss UV coating makes it resistant to the weather, scratching, and abrasion. All labels come with crack & peel backing for easy application. Start custom label printing by uploading a ready-made design or creating a new file with our online design tool. Our print experts will guide you every step of the way for you to enjoy our affordable rates. Does the turnaround time include the shipping transit time? Turnaround represents the number of days required to produce your job. It does not include shipping transit time or direct mail processing time. All turnaround times are based on business days and exclude national holidays. To find out your order’s transit time and expected arrival date, click on “Get Shipping Estimate” at the bottom of the online calculator. This will show a full list of shipping prices based on your preferred arrival date. What is the difference between white paper and white vinyl sticker materials? White paper stickers are best used on items stored and displayed indoors. Use white sticker paper on products that don’t need refrigeration and won’t be exposed to water. White vinyl stickers are thicker and more durable, able to withstand exposure to outdoor elements such as UV light and water. What is the difference between gloss and high gloss coating? Gloss coating gives your label some extra shine and reflects against the light. It can also be written on using a ballpoint pen. High gloss coating gives a greater shine and makes the label UV resistant. It is not writable but does withstand wear and tear. 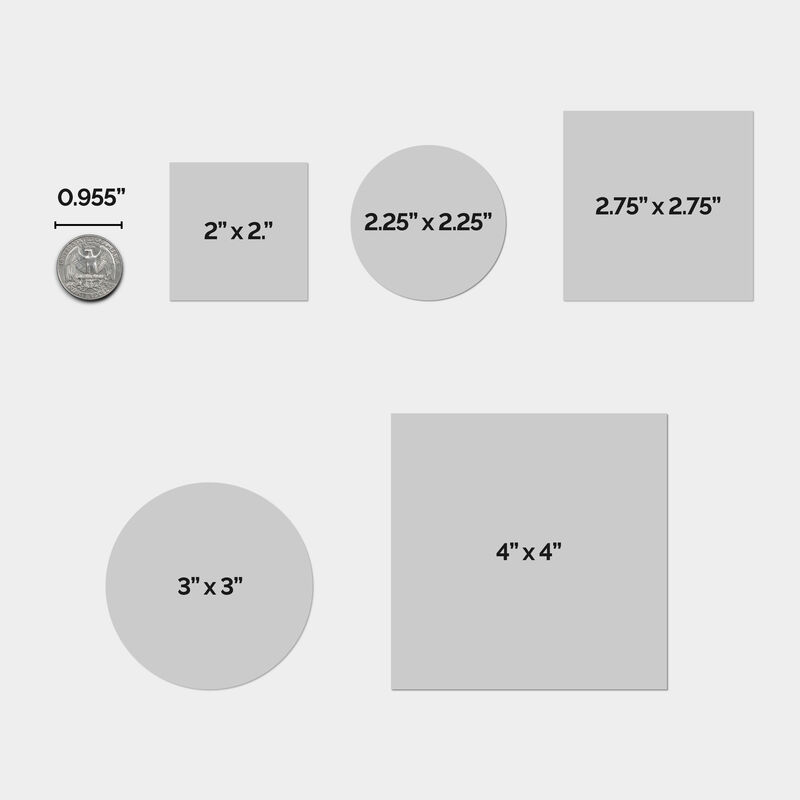 Our layout templates also ensure that your product labels meet our printing guidelines with bleed lines. You can download the right layout template in an EPS, PDF, or JPG format. It’s important to keep certain design rules and branding purposes in mind when creating your custom labels. Here are a few tips to help you create standout personalized labels. Keep things clear and simple - An effective label should always serve its main purpose. So if it’s a food or drink label, make sure the storage and heating instructions are easy to read. Use bright and attractive colors - You can’t go wrong with bold colors. Contrast bright colors with a white background and avoid neon hues. Add a useful feature or piece of information - Print a recipe as part of your food label or add a fun activity like a maze. Studies show that these features entice customers to purchase the item. Stay on brand - If you mail information to your clients or prospects, don’t overlook the importance of printing a branded label to make a professional impression. Use mailing labels, shipping labels, and return address labels to carry over your marketing brand. We also print custom labels on uncoated paper stock for adhesive name tags, food labels or carton labels. Since our label stock is laser-safe, you can have it professionally printed here and then personalized with specific names or products with your own laser printer. Just remember to design them using a compatible size.